Giles Norrington was born in 1935 in Ohio. He enlisted in the U.S. Marine Corps on January 11, 1954, and completed basic training at MCRD San Diego, California, in April 1954. PFC Norrington attended infantry training at MCB Camp Pendleton, California, from April to June 1954, followed by service as a Telephone Trouble Shooter with Headquarters & Service Company, 2nd Battalion of the 3rd Marine Regiment at Camp Fuji, Japan, from July 1954 to April 1955. Sgt Norrington next served as an Infantry Squad Leader with E Company, 2nd Battalion, 7th Marine Regiment of the 1st Marine Division at Camp Pendleton from April 1955 to May 1956, and then as a Duty Brig Warden with the Base Brig at Camp Pendleton from June 1956 to May 1957. He attended Navy Justice School at Camp Pendleton from May to June 1957, followed by service as a Legal Clerk and Court Reporter at Camp Pendleton from June 1957 to March 1958. Sgt Norrington then attended Officer Candidate School at MCS Quantico, Virginia, from March to June 1958, and was commissioned a 2d Lt in the U.S. Marine Corps on June 7, 1958. 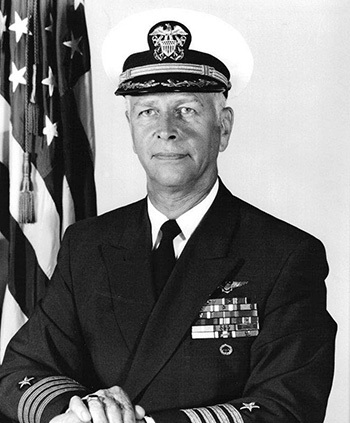 Lt Norrington next attended the Officers Basic School at Quantico from June 1958 to March 1959, followed by Flight School from March 1959 until he was designated a Naval Aviator in August 1960. Capt Norrington served as an A-4 Skyhawk pilot with VMA-242 at MCAS Cherry Point, North Carolina, from September 1960 to March 1962, and then as a flight instructor with VT-22 at NAAS Kingsville, Texas, from March 1962 to March 1965. During this time he received an interservice transfer to the U.S. Navy on February 19, 1965. LT Norrington then served as an RA-5C Vigilante pilot with RVAH-1 at NAS Sanford, Florida, and deployed aboard the aircraft carriers USS Independence (CVA-62) from 1966 to 1967, and USS Enterprise (CVN-65) from January 1968 until he was forced to eject over North Vietnam and was taken as a Prisoner of War on May 5, 1968. After spending 1,775 days in captivity, LCDR Norrington was released during Operation Homecoming on March 14, 1973. He was briefly hospitalized to recover from his injuries at NAS Jacksonville, Florida, and then attended A-4 training at NAS Cecil Field, Florida, from July to October 1973. After serving with the Naval Training Equipment Center and at Naval Support Facility Diego Garcia, CDR Norrington served on the staff of the Deputy Chief of Naval Operations for Air Warfare in the Pentagon from January 1976 to June 1979, followed by service as Head of the Budget and Legislative Section of the Program and Budget Branch, and as Executive Assistant to the Deputy Chief of Naval Operations for Air Warfare from June 1979 to May 1982. His next assignment was as Commanding Officer of NAS Whiting Field, Florida, from May 1982 to October 1983, and then as Director of the Appropriations Committee Liaison Office and as Assistant Director of the combined offices of Budget and Reports, Navy Comptroller and the Fiscal Management Division, Office of the Chief of Naval Operations in the Pentagon from October 1983 to July 1985. After completing Naval War College, CAPT Norrington served as Director of the Total Force Training and Education Division in the Office of the Chief of Naval Operations at the Pentagon from September 1986 until his retirement from the Navy on July 1, 1988. For exceptionally meritorious conduct in the performance of outstanding service as a Prisoner of War in North Vietnam from May 1968 to March 1973. By his diligent efforts, devotion and loyalty to the United States and under the most adverse of conditions, he resisted all attempts by the North Vietnamese to use him in causes detrimental to the United States. While in daily contact with the North Vietnamese guards and officers, he performed duties in staff positions and maintained good order and discipline among the prisoners. Further, he served as an educator providing diversion and constructive rehabilitative thinking to his fellow prisoners during their long internment. Despite harsh treatment and a lack of material aids, he devoted long hours toward improving their morale and well-being as a member of the entertainment group. His extraordinary skill, resourcefulness, and dedication to duty throughout his lengthy confinement reflected great credit upon himself and upheld the highest traditions of the Naval Service and the United States Armed Forces.